Last Friday I had a meeting with one of teams, Freddy, who is taking care of cloud services as our product manager, told me he had to deal with a customer asking for IaaS services on our cloud enterprise for a couple of SAP systems, because he, the customer, had thought the SAP PaaS is too expensive for him. Freddy made the arrangement to ensure this customer could get the requested proposal and called him to letting him know it and at the same time to ask him, why does he think about PaaS for SAP is too expensive? The answer to this question was: because when you make the numbers the cost per virtual machine is almost 5 times more expensive than any IaaS’s server in the market. Then Freddy asked him: Have you ever considered the cost to manage these servers and the rest of the stuff that involve an operation like this? 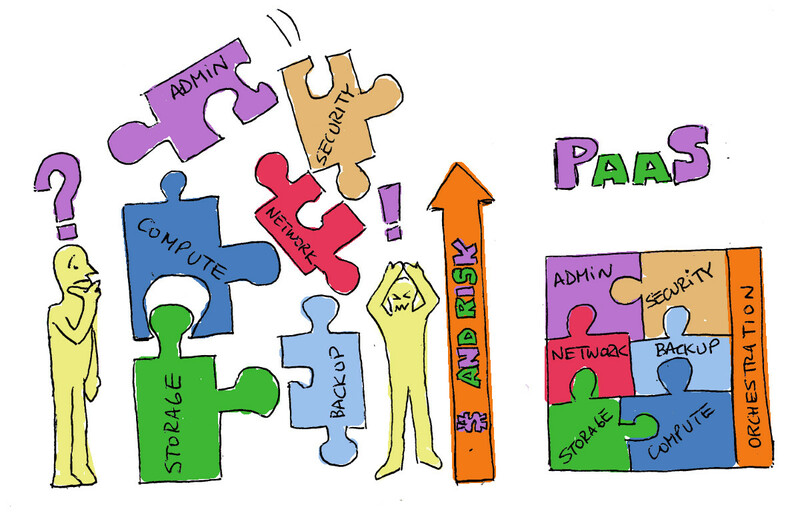 A PaaS has people managing your server at OS level. How much money you think you need on top the server you have just got. Well, let’s think about another USD 150/month. Now you need a good performance block storage capacity with a nice performance with a special disk layout for SAP. Let’s start with 200GB of disk adding around USD 100/month to your cost – Not considering the cost to have an administrator for storage resources with some knowledge on SAP, those costs are additional. Now you need to manage your database. How much you think a cloud company could charge you to manage that at in a basic level. First, you need to find somebody that can offer that with some knowledge in SAP. Let’s do it simple, USD 1,500/month could be enough. However, despite any known cloud provider offer you to manage the databases, just a bunch of them can support enterprise versions, and less over 20GB size. Then, probably you need to find a separated company to do that. Now the backup. You have to find somebody that can manage backup at database level and with some experience in SAP – in order to meet recommended vendor practices to run SAP you need the appropriate report to evidence that you are doing it well, this is basic, SAP consultant don’t put a finger on it if they don’t have a backup report-. Current Cloud providers only offer backup in a very simple format and usually it is reduced to files only. Again, probably you need to find a separated company that can manage your backup and provide the required infrastructure and technology. Let’s thing that could be do it charging you no more than USD 500/month. Now there is a lot of things left at infrastructure and management level: security, monitoring (i.e. : you need more servers to run SAP Solution Manager), a cluster replication software compatible with SAP (you have the two machines for high availability, but you need to keep them synchronized) and networking. When you have to deal with specialized SAP tasks like transportation processes, system copies and system refreshes, all these services need to be paid separately. A SAP functional consultant won’t do anything until you provide him the appropriate landscape through these tasks. I can keep on adding more things, but probably with the above mentioned statements you already have got the main idea. I’ve just showed how much complexity and over-cost you are facing when you decide to compare an IaaS with an specialized PaaS solution for SAP. Probably this server is finishing about 10 times the price, with a lot of not covered issues between its components. If you choose IaaS over an SAP PaaS, that means your are considering to pay twice or more. Cost is not the only important thing here. There are other important things like performance, availability and time. Availability is when you have a good team behind that can react appropriately to solve any event on one of your most important applications. But, I am deeply sorry to say if you go for an IaaS solution, probably you have to deal with more than one company at once and try to make them work synchronized. You know how difficult could be to make different platform components’ administrators an operators to work together even if they work at the same company. The best thing of a PaaS is that you don’t need to worry about it, because they are already doing that, but probably the best thing is that all their most common administration and operation tasks are already orchestrated to lower human interactions (and risk) in your applications and save time. Therefore, orchestration is the key to save time and lower risks. 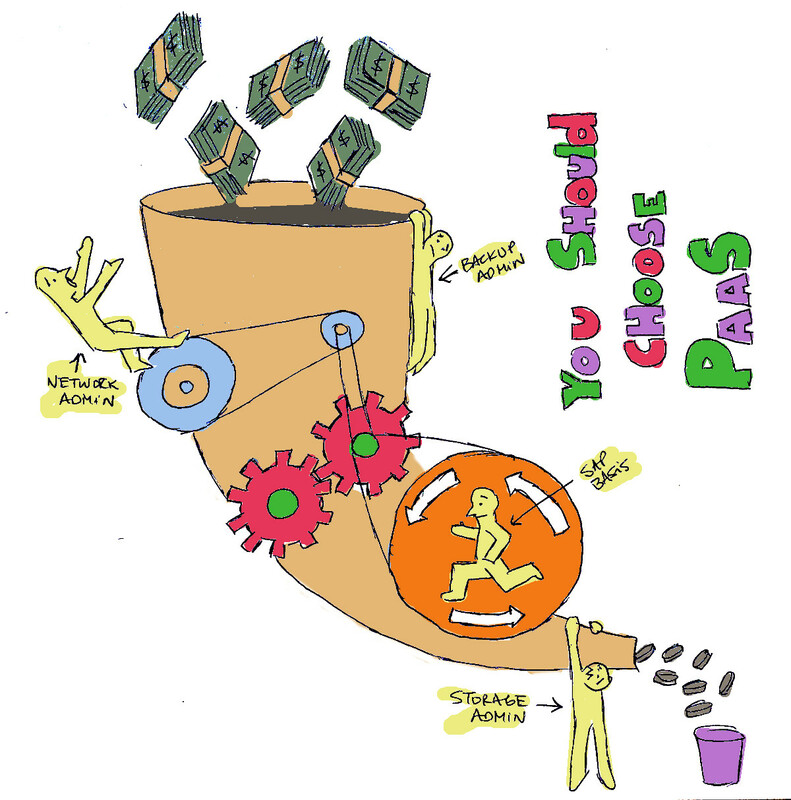 If your time is worthy, then you have to choose a PaaS. Don’t try going for IaaS to run this sort of specialized applications and have to support them by your own. Don’t waste money. Save time for your core business and meet your company’s owner objectives. Time is an asset that you will never recover for you, your family and your business. Have you ever heard the phrase “Cheap is expensive” or “Do not spend a million to save a penny”?